Smartprint based in Liverpool are involved in producing stunning commercial and industrial signage, printed banners and window graphics in the North West. With over 30 years experience in the print/signage industry, Smartprint provide the highest quality service, materials and solutions within the quickest possible time and at the best possible price. Stand out in the crowd with a prominent sign or custom made banner. 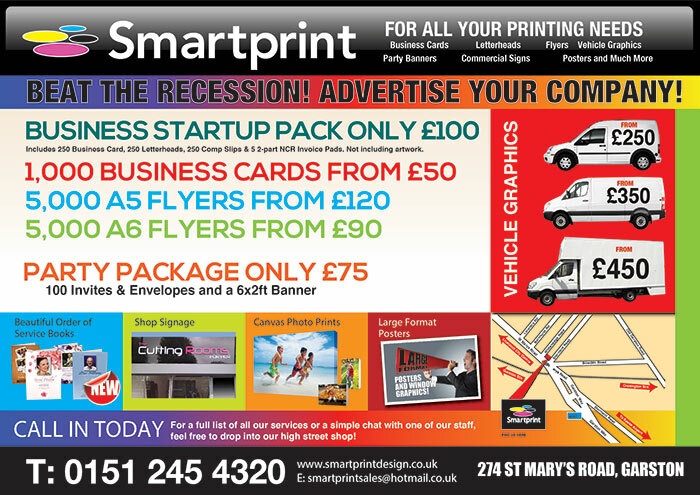 A cost effective way to promote your business or corporate image. Add stunning full colour displays to your shop or business frontage. Promote your business with window graphics, hanging banners and signage. If you are looking for high quality van branding, vehicle wraps or graphics; then you have come to the right place. With us you will find bespoke graphics, specialist branding and high quality wrapping service. Whether you want to visually enhance the exterior of your car or transform your brand with professional digital graphics; we have the skills and materials to make the most of your vehicles, signage and accessories at Smartprint. With Smartprint you can be sure that you receive the highest quality service. Whether you need a brand transformation that is tailored to your company or you simply want to give your car a fresh new look; our graphics specialists can design, fit and install the vehicle graphics of your choice. With eye catching designs and high quality 3M and Avery vinyls, you can trust our team to breathe new life into your brand.